“Whimsy is her forte”. Her charming, funny and candid artistry is well represented. 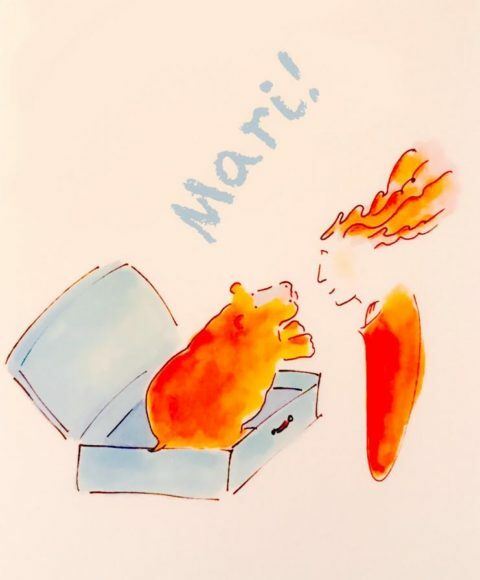 Mari, artist and author, can turn advocate in the blink of an eye. She’s a survivor as such a mentor for women in recovery. Her many books, particularly the new “Out of the Blue Valese”, is a must read for women under stress. It’s her first novel and as with her other books, will be available to purchase and have signed. She designed the large animal cut-outs for Dori Appel’s play, “Far From the Zoo” which can be seen up close at our exhibit along with her paintings and drawings.